This week on Friday Feast we have a very special guest… me! Heart of the Valley released yesterday and as I want as many people as possible to buy and read it, I’m taking over this week’s Friday Feast to mercilessly plug my book. Well, not mercilessly – I’m not that enamoured with self promo – but I’m going to make sure you know aaaaall about this wonderful, emotional read. Yes, emotional. I have it on good authority that people have been so moved by Heart of the Valley and the fate of its characters that they’ve cried. As Michelle, book editor of online magazine Beauty and Lace warns in her recent review, “…regardless of how tough you think you are you are going to need the tissues.” I also shed many tears during its writing, although not always for the same reason. As any (normal) author will tell you, writing can be bloody stressful! So in keeping with the established Friday Feast format, and because I’m painfully pedantic and like to keep things ordered, here’s the cover and blurb. You can also read the opening chapter at my website. Vivid, moving and passionate… yup, that about sums it up. But I should also mention that the hero, Lachie, is a complete and utter babe. There’s this bit where he… Oh, just go and buy the book and you’ll soon see what I mean. Right, enough of that. Let’s talk FOOD! There’s a sweet character in Heart of the Valley named Nancy Burrows who’s a gun country cook and one of those wonderfully generous souls who loves nothing more than to spoil those she holds dear with her delicious food. Nancy doesn’t do fancy food. Nope, Nancy makes hearty country fare like beef casseroles, chicken and vegetable soup, and Lancashire hot pot. And she bakes. Oh, does she bake. There are ginger biscuits, apple and rhubarb crumble, and Lachie’s favourite, bread and butter pudding. So I thought I’d dedicate this Friday Feast to Nancy Burrows and share the sort of recipe that she’d make. Which is rather fitting now that fickle Melbourne has finally abandoned its Indian summeriness and instead decided to blast us with cold and rain. I don’t know about you, but when the weather turns horrid, my stomach craves old-fashioned winter comfort food, and what better warming food is there than a rib-sticking soup? My mum, bless her, isn’t the most enthusiastic of cooks, although she can whip up a damn fine pavlova. My grandmother taught me how to bake but, overall, I’d call myself a self-taught cook. However, one of the recipes I did learn from Mum growing up was her pea and ham soup. There was no recipe as such; Mum just knew how to make it. I assume she learned from watching her mum, which is exactly how I learned too. This is perfect winter fare. Thick, delicious, warming and satisfying. I loved coming in from the freezing cold, soaked and mud-smeared after a game of hockey or hair-covered and reeking of horse after a morning spent riding, and being served a great bowl of this soup with buttery toast. It was so damn homely. Nearly as good as a hot shower or a loving cuddle. Mum always made her soup with bacon bones, but I use a smoked ham hock because I enjoy having all that gooey meat to chew on. Just make sure you allow plenty of cooking time so the meat completely falls away from the bone. I also occasionally substitute some of the soup mix for plain barley simply because I love the stuff. Oh, and all quantities are variable. Adjust to however you prefer or to the ingredients you have on hand. As for how much this recipe makes… um, a lot. Enough at least to feed a ravenous family with some left over. There you have it. A recipe even Heart of the Valley’s Nancy Burrows would be proud of. So what are you waiting for? Go grab that stock pot and start simmering! 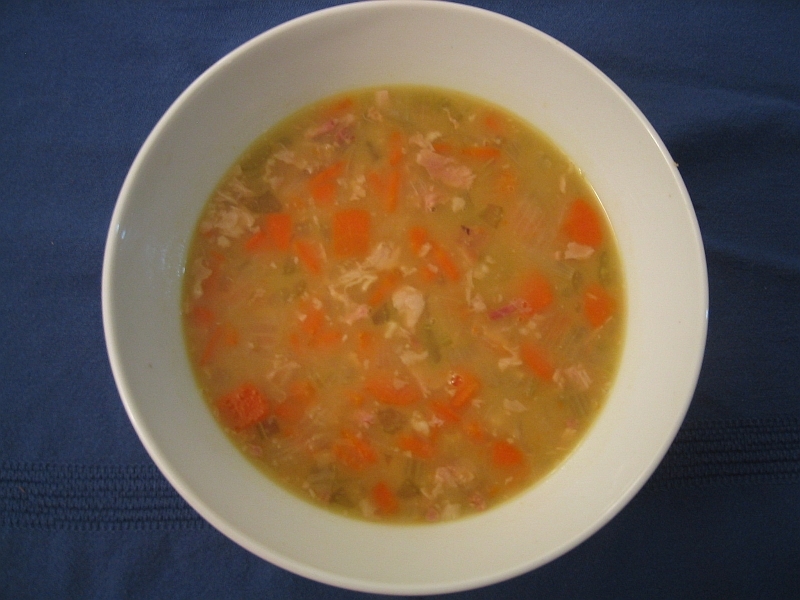 Place ham hock, onions, carrots and celery into a stock pot and pour in enough water so the hock is covered. Place on the stove and simmer, lid on, for three hours or until the meat is falling off the bone and a good stock has developed, adding more water if necessary to ensure the hock is always covered. Remove ham, peel off the skin and discard. Shred the meat, then return meat and bones to the pan. Test the soup for salt – usually quite a bit is required. Add soup mix, and simmer with the lid on for another two hours or until the pulses are soft. Serve piping hot with good crusty bread or hot buttered toast. Now, my feasty lovelies, it’s giveaway time and what a prize I have on offer. Oh yes indeedy! One lucky commenter has the chance to win a signed copy of my brand spanking new release, Heart of the Valley, that vivid, moving and passionate book you see above, which is already earning rave reviews (I have proof!). Winter is just around the corner (or already here if you live in Melbourne) and I’m on the hunt for some comfort food inspiration. Winter-perfect meals are what I’m after. Casseroles, puddings, soups – whatever makes your mouth water. Just share your favourite winter dish and you’ll be in the running to win a copy of Heart of the Valley. So get commenting! I’m going to use my blog owner’s prerogative and add a few more days to the normal giveaway closing time so I can pimp this post and my book for longer. Hey, a girl has to do what she can! Anyway, this time you have until midnight, Thursday 3rd May, 2012 to leave your comment. Australian addresses only, sorry. Now, in case you haven’t interacted enough with me yet, besides this blog I also play around on Twitter and Facebook, but only when I’m not hard at work daydreaming of bestsellerdom. This giveaway is now closed. Congratulations to our lucky winner, Beck! Your copy of Heart of the Valley will be winging it’s way to you very soon. Thanks to all who entered. Some great comments as always. This entry was posted in Friday Feast, Heart of the Valley and tagged Australian romance authors, Australian Writers, Beauty and Lace, Cathryn Hein, Food, Friday Feast, Heart of the Valley, Hunter Valley, Promises, promo, Recipes, Reviews, Romance Writing, Writing on April 27, 2012 by cathrynhein. Cathryn, huge congratulations on the release of Heart of the Valley. I hope it’s a bestseller for you. Soup, it has to be soup. Nothing beats home made tomato soup, though my son has recently discovered an Asian chicken, ginger and beansprout soup that warms you to the marrow and tastes brilliant. My other current favourite for a cold night is a meal cooked in a tagine (the Moroccan flat bottomed slow cooker with a lovely conical lid). It’s chicken with preserved lemons and green olives, cooked till it’s mouthwateringly tender then served with couscous and fresh coriander. Yum! I can almost taste it. I hope it’s a bestseller too, Annie!!! Oh, I love Asian style soups. I have a bunch of different ones I make – some mild, some blisteringly hot. My favourite is the tom yum soup I learned to make at a cooking school in Thailand. Seriously delicious. Tagines are wonderful things. They make meat so succulent and flavoursome. Definitely great winter food. Excellent suggestion, Annie. Thanks for dropping by. I’m looking forward to your Feast next week! Big congrats Cathryn on the Heart of the Valley release! It looks like a wonderful read!! It’s turned cold here in SA and i made a soup this week. Not so delicious as your recipe sounds (a diet type one so no crusty bread). Hubby makes my 2 fave soups, both mexican. One a summer soup with clear broth and fried tortilla chips and shredded chicken and coriander with a little chilli topped with sliced avocado and the other a winter warmer with chilli and cream and rice and chicken and carrots and mushrooms. Hey Beck wondering if you could post your summer soup receipe – its not something i would eat but sounds like something my sister would love! I can vouch for the summer soup! I’m lucky enough that I’ve tasted Bec’s hubby’s delicious dish! And I STILL dream about it over two years later! Okay, Beck, you’ve heard the call. Share!!!! nothing beats a good soup in winter, i have a receipe from a friend for a delish pumpkin, sweetpotato & bacon soup (that also has carrots & potatos in it so good!) or dad’s favourite potato and leak soup. But even better to warm the heart is to top it off with good old golden surup dumplings with ice cream (i know its cold but it melts quickly!) just like a hug from the inside. My other favourite is spaghetti & meatballs because its so great to share with friends along with some yummy garlic bread at a nice bottle of pink muscato! I can’t wait til I can finally get a copy of your book to read – thanks for the warning about needing tissues – i’m the kind of person who crys easily (that quit smoking add with the little boy left behind at the train station does it every time) so will definately have a box next to me! OMG Bec I NEED THAT soup recipe. Oh, oh, oh!!!!! Golden syrup dumplings. I haven’t had them in YEARS but they are awesome winter food. What a fantastic idea, Bec. Makes me want to make some right now (except I’m feeling too lazy and knackered after another big day on the promo trail). And I’m with Rach, that soup sounds delish! I really hope you enjoy Heart. You should be able to get hold of a copy soon. I’ve had reports of it being spotted in the wild so it’s out there. If your being naughty can serve with some cream too. I’m going to cheat and not leave a recipe because I’ve already got a copy of HotV (yes, bragger) and don’t need to win one. But I might try YOUR soup. It sounds yummo! It is yummo. Probably horribly bad for you thanks to all the fat in the ham hock but that’s also what makes it taste so good. And it does have lots of fibre from all the veges and pulses, so not all bad. Hi, I’d love this fabulous prize! Thank for the opportunity to win! My favourite winter dish is a Mediterranean Chicken casserole. Basically I use diced chicken fillet, brown it with onion, a red capsicum and garlic, then add some semi dried tomatoes, black olives, tinned tomatoes, lots of fresh herbs, and stock. Simmer for about an hour and a half, until chicken is tender, and serve with pasta or rice. It’s delicious!! Now that sounds very yum, Michelle. Easy, quick and healthy. Perfect for a weeknight winter meal, I reckon. Love recipes like that. Thanks so much for sharing. And thanks for dropping by the blog! I wish you all the best in the draw. OK, it’s midway between breakfast and lunch here in WA and after reading your post I am STARVING!!! If you don’t get me on Twitter, you get me on your blog!! Hello, Ms Christina and thanks for the release day joy! Oh, yeah, I’m with you on the roast beef and Yorkshire pud. LOVE. I was at Queen Victoria Market on Friday and went completely drooly over all the standing rib roasts in the meat hall. Would have bought a couple if I could have carried them, but without my special market trolley they were a bit much. Next time though! Hope you get a juicy roast with all the trimmings this Mother’s Day. Best of luck with your lovely new book, Cathryn and thanks for the soup. The weather has been so feral here lately that soup is sounding very attractive. You’ll need the nourishment on the promo trail. May it sell its horsey socks off! Thanks, Imelda! You’re right about needing plenty of nourishment on the promo trail. I had a couple of radio interviews in the city on Thursday and Friday and was knackered afterwards. No idea why. It’s not as if sitting in a booth and yacking is strenuous but I suspect it’s the mental thing. I certainly hope Heart sells its horsey socks off too! Thanks so much for dropping by. Lovely to see you here. Hubby’s summer soup is tricky because he makes his own tortillas from scratch then fries them to make crisp strips (low fat i’m sure). Other than that he poaches chicken in stock. Then uses the broth for the base. Adds shredded chicken, the ‘chips’, a pile of coriander and then slices of spring onion and red chilli that have been softening in warm stock. He adds sliced avocado on top on its way to the table and serves with lime wedges to squeeze over. The exact ratios are all done by taste. Oh, and lots of freshly ground black pepper. It’s good cos you can leave out any part (i don’t have a heap of chilli, his dad doesn’t eat avocado). He made it yesterday for his mum’s birthday and it was truly sigh-worthy. Not least cos I didn’t have to cook! Your hubby makes his own torillas????? That’s awesome. The recipe sounds delicious, Beck. Really healthy (except for perhaps the tortilla chips) and easy to make. Love soups like that. Thanks so much for sharing. You two Bec(k)s are on fire with the fab recipes! MUCH appreciated. Congratulations on the release of Heart of The Valley, Cathryn. Exciting times, huh? Winter warmers – well I love a big pot of pea and ham soup as well. At the moment I’ve got a beef broth I’ve just turned off after 20 hours at a bare murmur. Now to strain and freeze 🙂 Favourite winterwarmer recipe is something like a steak and kidney pie with shortcrust pastry made VERY short and the gravy bubbling and oozing up around the edges. Yum. Thanks for the congratulations, Louise. It’s been a great release week so far. Now, I’m not much of an offal eater, but that description of steak and kidney pie with all the gravy bubbling up and really short pastry has my mouth watering! I haven’t made a meat pie in donkey’s but if this weather keeps turning Arctic, that situation will definitely change. Beef and gravy…mmmmmm. I was out early on the morning of the 27th stalking the staff at Big W for my copy. Now it’s teasing me from my TBR shelf. I see a night of Pea and Ham soup next to the fire with your book coming up in my future. I hope you smiled and stroked that lovely quote of Mission: Romance’s on Heart’s back cover, Juanita. It’s a beauty! Pea and ham soup with some hot buttered toast is perfect fireside food. And it’s dead easy to make. As for Heart being a best-seller, I dream!!!! Yay, Cathryn, congrats on the release of Heart of the Valley! Can’t wait to read it!! Love the sound of your Mum’s pea and ham soup. Pork sausages from the butcher up the road are still my favourite winter comfort food, served with creamy mash potato, onion gravy and peas. I don’t often eat sausages, but on a cold night, after a long day, there’s something familiar and safe and yummy about them. Of course pumpkin soup with ginger and lemon grass, or sticky date pudding rate highly on the list as well! I’m not much of a sausage eater either, Helene, but there is definitely something winter-perfect about sausages and mash with onion gravy. All that luscious fatty goodness steaming on the plate. Probably disgustingly bad for us but sometimes you just have to indulge. Thanks so much for the congrats! And the random number generator has picked BECK as our lucky winner. Congratulations! Thanks to all who entered this giveaway. Hope to see you back for another Friday Feast session next week.